Jeff and I spent Memorial Day weekend sans kids in Pittsburgh. We decided that since east-bound beach traffic would be heavy, heading west was a good idea, and Pittsburgh is only about four hours from DC. So off we drove, in the stunned silence of burned-out parents of small children, into the real world. 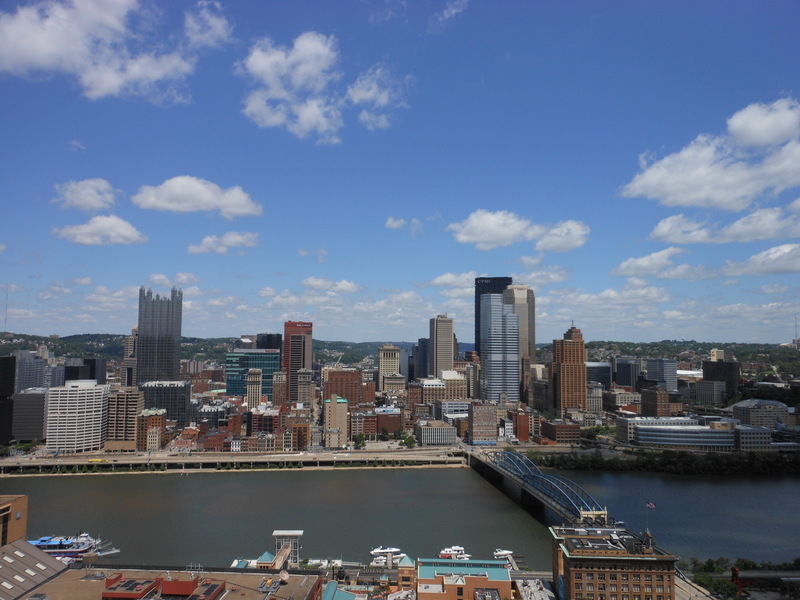 Pittsburgh sits at the point where three rivers meet, and its historic bridges (446 of them!) define the city. We walked four miles the first day, just wandering, stopping for beer and fried oysters at the Original Oyster House, and ending up at the Penn Brewery for cheap, excellent microbrews and pierogi. The next day, we were excited to visit the museum of Pittsburgh native Andy Warhol, which features not only his iconic artwork, but the many films he made and the TV specials he hosted in the early 1980’s. There was also a duplicate of his “Silver Clouds” installation from the 1960’s; basically, Mylar balloon “pillows” in a room, floating courtesy of wall-mounted fans. I imagine this would be great for kids, but the adults were having a lot of fun too. Most unique were his “oxidization paintings,” which were created by having friends urinate on a canvas coated with metallic paint. The colors varied according to the chemical contents of the urine; Warhol was said to be preferential to one of his assistant’s urine, which created especially vibrant colors. We finished the day with friends, enjoying dinner at Soba and fireside hometown brews at Porch. Glad you enjoyed your trip to Pittsburgh! We love our city! It is a great city – there is much more of it we want to see – next trip!